Thomas Nast was born on September 27, 1840 in Landau in der Pfalz, then an autonomous region of what is now modern Germany. His homeland is also known as the Rhineland-Palatinate, a region that had historic links and union with Bavaria. He and his siblings were baptized at Roman Catholic Church of Sankt Maria (Saint Mary’s) in Landau (FamilySearch.org). Landau was a Protestant and Catholic region close to the French border. Religious tensions existed – most notably among Catholics. “When the Nast family left Bavaria in the 1840s, events in Europe pitted the Pope and Catholic orders –especially Jesuits–against liberal reformers and radical revolutionaries” (Justice 175). The Jesuits adhered to a traditional or ultramontane dogma that acknowledged papal infallibility and advocated a strong Roman Vatican control over its flock. Though it cannot be firmly established, Nast’s art deriding the Pope’s inability to commit human error, suggests the Nast family sympathized with the reformist camp of Catholics practitioners. In America, Nast was not a good student, with a language barrier being an early obstacle. His official biographer, Albert Bigelow Paine, suggests that Nast’s was educated in Catholic schools and that the strictness and “rod and ruler” punishment disturbed Nast and did little to encourage his study habits. There are references to stern-faced female principles, but it is not expressly stated these women were nuns. Nast’s Catholic education came to a close at the age of 13, when “he left when required to confess, regarding his sins as too many and too dark for the confidences of the priest’s box” (13). What dark sins could a boy of 13 have? The passage is ambiguous and an active imagination might draw inferences of abuse. If some level of abuse existed it would explain the origin of negative feelings toward Catholicism or clergy. Harper’s also confirms Nast’s Catholic education in a short biographical profile, written at the height of his popularity and his anti-Catholic attacks (HW Aug. 26, 1871). The Nast family arrived in New York City in 1846, just before the largest numbers of Irish Catholics arrived to escape the Famine. 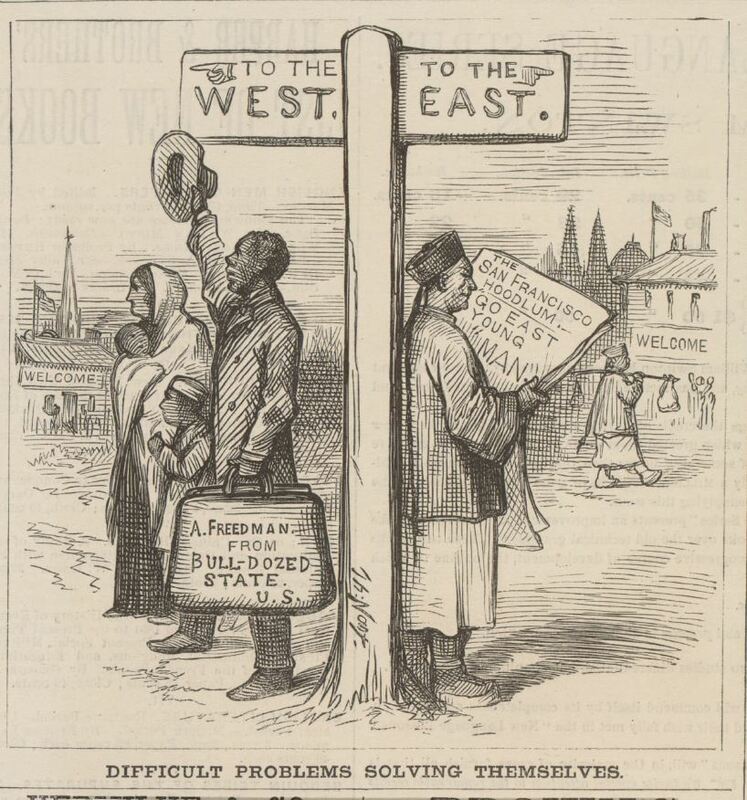 Nativism, an anti-foreign sentiment felt by many American-born Protestants toward new immigrants, was in full swing. Nativism grew as a direct response to increased immigration to America and peaked, when immigration did, during the Famine era. Between 1845-1855, an estimated one and a half million Irish, most of whom were Catholic, flared nativist concerns of Catholic takeover and prompted nativists to organize into secret societies, such as the Know Nothings. When the Nast family established their American home, distrust of foreigners in general had narrowed to fears of Irish Catholics in particular. The Nast’s family’s attitudes for or against the Irish cannot be established. If they were reformist Catholics, the conservative brand of American Catholicism would not have been to their liking. There are other circumstances to consider as well. Historians William Meagher, Kerby Miller and others agree that German immigrants fared better than most of their European counterparts at the time, possessing education or skills in trades that enabled them to quickly find employment and better living conditions in New York City. Paine makes a point to describe the first Nast family dwellings in New York City as being on west side and “respectable.” Most new immigrants occupied the Lower East and Lower Central part of Manhattan.The Nast family may have considered themselves in a higher class, than Irish who, as immigration progressed, arrived with less skills and options, and were forced to live in destitute conditions in notorious neighborhoods. If the Nast family were reform-minded Catholic practitioners, they may found the Episcopalian faith an attractive alternative to practice and a means to distinguish themselves from Irish Catholics who observed a more conservative or ultramontane doctrine. Immigration historian Kerby Miller theorizes many early Catholics made the religious change in order assimilate into dominant Protestant culture in America. A clue to their religious shift might be indicated in burial place of Nast parents, who are interred in Woodlawn Cemetery in the Bronx (Hayes 4). “The fact that she [Nast’s mother] is buried in Woodlawn Cemetery, a non-sectarian cemetery might be somewhat of a clue,” wrote Father Morris of the New York Archdiocese, “It was rather rare, at least until prior to the Ecumenical Council for Catholics to be buried in unconsecrated ground. If so, special dispensations were required” (Email 30 Apr. 2012). According to research done by Benjamin Justice, when Thomas Nast and his wife relocated to Morristown, New Jersey in 1871, they became members of the St. Peter’s Episcopal Church and their children were christened in that faith. Whatever his religion was at the time, Nast began his professional career at the age of 15. In New York City, the most notable weeklies were Frank Leslie’s Illustrated News, the New York Illustrated News, and the most respected and prominent, Harper’s Weekly. Nast had worked for them all–and in that order– but happily achieved his goal to work full time at Harper’s in 1862 (Paine 28). Established press organizations in the northeast promoted Protestant-based, pro-Republican ideals, and during the Civil War, adopted a pro-Union stance in their editorial positions. The two leading daily papers, The New York Tribune and the New York Times, were Radical Republican and mainstream Republican.” The publishers and staff of Harper’s Weekly, including cartoonist Thomas Nast, were mainly Protestant or secular liberals” (Kennedy, HarpWeek). The more progressive Tribune led as an early advocate for abolition and “attacked Lincoln daily, demanding emancipation” as a cause for Lincoln to adopt (Paine 79). Other media followed suit. Harper’s was “strongly Methodistic in trend” (Mott 86) and part of a publishing center that “loathed the political culture and style of the Democrats and resented their control of the metropolis,” (Fischer 8). Northeastern Methodists joined other Protestants in a strong alliance of moral authority and civic duty that sought freedom of slavery. “No single issue had greater power than slavery to shape Methodist political responses,” (Carwardine 597) and Northeastern Methodists, like most Protestants in that region, were Lincoln supporters. In 1861, a year before he began as a staff artist at Harper’s, Nast married Sarah Edwards, the daughter of English-born parents. Nast figuratively and literally, as historian Robert Fischer suggests, “married into old-line Yankee culture and embraced it with the fervor of the prodigal son come home” (29). His background, the culture of his employers (cartoon historian Donald Dewey writes that the Harper family had an established anti-Catholic bias) the American Catholic stance against abolition, and marriage into an Anglican family all coalesced to shape Nast’s Republican views, steering him to a conviction of Protestant superiority. For his book, Paine interviewed Nast toward the end of his life. His anti-Catholic drawings are not discussed in detail in the large biography. But in an effort to explain away the anti-Catholic reputation that had obviously followed Nast, Paine echoed an earlier Harper’s profile piece and wrote, “He was inspired by no antagonism to any church–indeed he was always attracted by Catholic forms and ceremonies” (150). 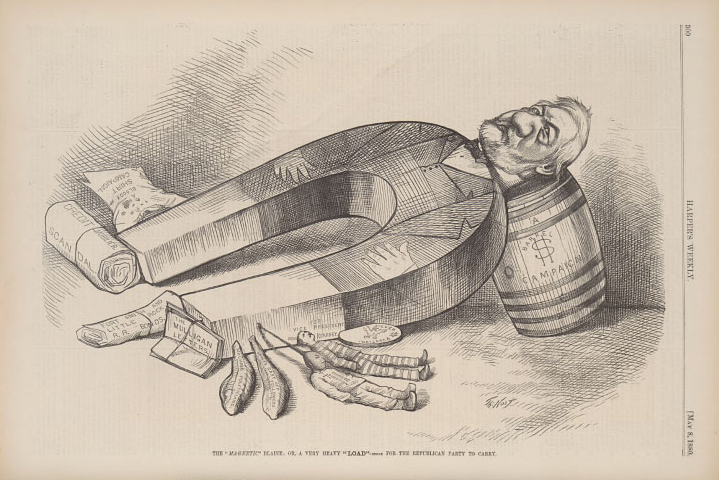 Outrage over Nast’s treatment of Irish Catholics continues to permeate in modern Hibernian societies and is the primary reason that “the Father of the American Political Cartoon” has been kept out of New Jersey’s Hall of Fame.